The Astounding Origin of Tenali Raman : Tenali Raman recalls his past on the occasion of a grand feast hosted by the king. He reveals how a Sanyasi led him and his favourite cat Sundari to seek the blessings of Kali. How he tricks the Goddess to kali granting him the boons of wealth and wisdom forms the crux of the first part. Jeopardy Jester : Rajguru maltreats his servant under the guise of a contract. When the case comes to the court, Tenali Raman agrees to be the servant of the Rajguru. The rest of the story shows how Tenali Raman teaches Rajguru a lesson. The Silly Foreigners – Three eminent foreigners visit Vijayanagara. Due to a costly lapse the Rajguru loses his post and is made an elephant boy. Adding insult to injury Raman is appointed in place of Rajguru. An angry Rajguru plots with an evil tantric to unseat Raman and how Raman foils the plan forms the rest of the story. Imported Horse – A horse trader tries to cheat the King into buying his horses with the help of Rajguru. How Tenali Raman intervenes and foils the plans of the evil horse trader forms the storyline. 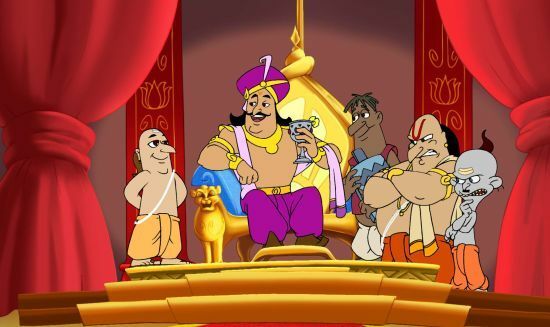 Tenali Raman and The Thieves – Two expert robbers recruited by Rajguru plan to rob Tenali Raman’s house. Tenali Raman outwits them in a hilarious faceoff.